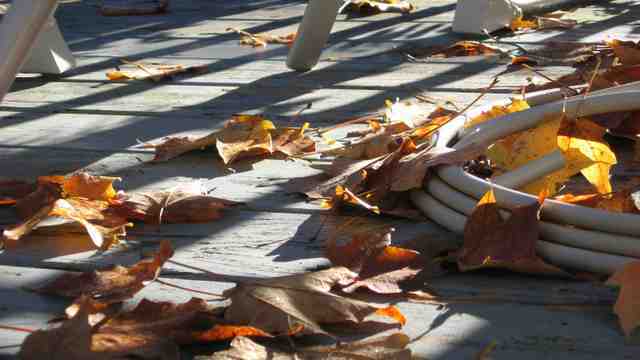 Light and shadow and autumn leaves almost hide the fact the back deck needs a paint job. Eight-thirty, Sunday morning, October 21, 2007. Really nice photo. It's all about light. Mike, I'm glad you liked the photo. Means a lot coming from you. Best thing about my new digital camera is that I don't worry about wasting film. I'll take a dozen shots of the same subject. One of them is bound to turn out ok by accident. You're not harming film with dangerous chemicals anymore? Bravo. And you're right about the freedom, so go ahead and pretend you're David Hemmings in "Blow-Up." It's fun.